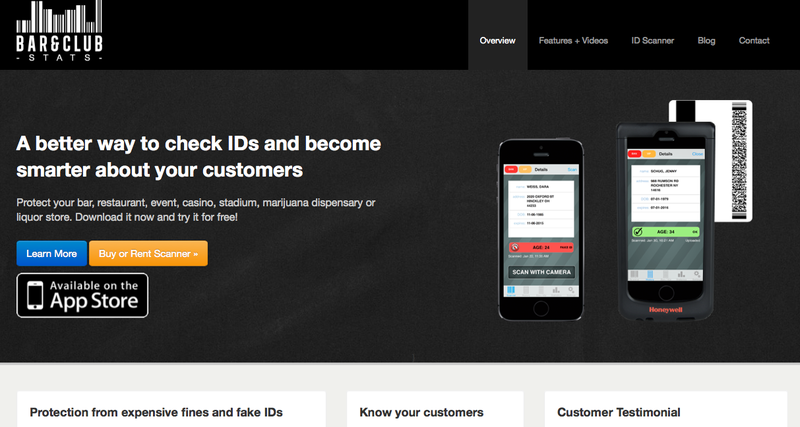 In the Age of Apps, would you believe that there are establishments that still check IDs as if tech had never happened? Fine, if you want to do it the old fashioned way, but in an age of Big Data, would you believe that there are venues that still check IDs, as if knowing who your customer is wouldn’t help to improve business? There are 500,000 venues that sell products that require patrons to show proof of age and that’s (part of) what Bar & Club Stats is about. Based off an iPod, iPad, or iPhone, the B&CS ID scanners provide age verification services wherever alcohol tobacco and marijuana (yes, there’s that now, too) are sold and enable establishments to become smarter about their customers. The company aggregates anonymous demographic data (time of entry, age, gender, zip code) to see the number of repeat customers, average age and distribution, gender split, patron flow, compare days, compare weeks, creating a new data set to help users and marketers better understand their customers. And speaking of being in the right place with the right data, New York State is currently introducing “Hard Card” legislation, which, if passed, would require bars and venues that sell liquor to minors to purchase an ID scanner or face a $2,000 fine. The B&CS ID scanner is also currently being used by some of the most popular bars, clubs, casinos and arenas in the United States and Canada. Other customers include the St. Louis Blues, Santos Party House, Lights All Night, Dream Downtown and Wahoo’s. In fact, the software is about to be deployed by a stadium in Rochester. It’s the back end analytics that sets the app apart – and what seems to be bringing customers back and the word of mouth spreading.